Edge Shave Gel is teaming up with Assassin’s Creed for Assassin’s Creed Unity to give those gamers some awesome advantages while they play. In partnership with the game, Edge Shave Gel is introducing limited edition cans featuring Assassin’s Creed Unity artwork – giving guys the ultimate edge as they play by offering exclusive access to downloadable content including swords, armor and more. Edge Sensitive Skin Shave Gel gives access to an exclusive downloadable sword, contains aloe, and helps prevent nicks, cuts and irritation. Edge Extra Moisturizing Shave Gel gives access to exclusive downloadable armor and has vitamin E and a blend of ingredients to leave your face hydrated and smooth. 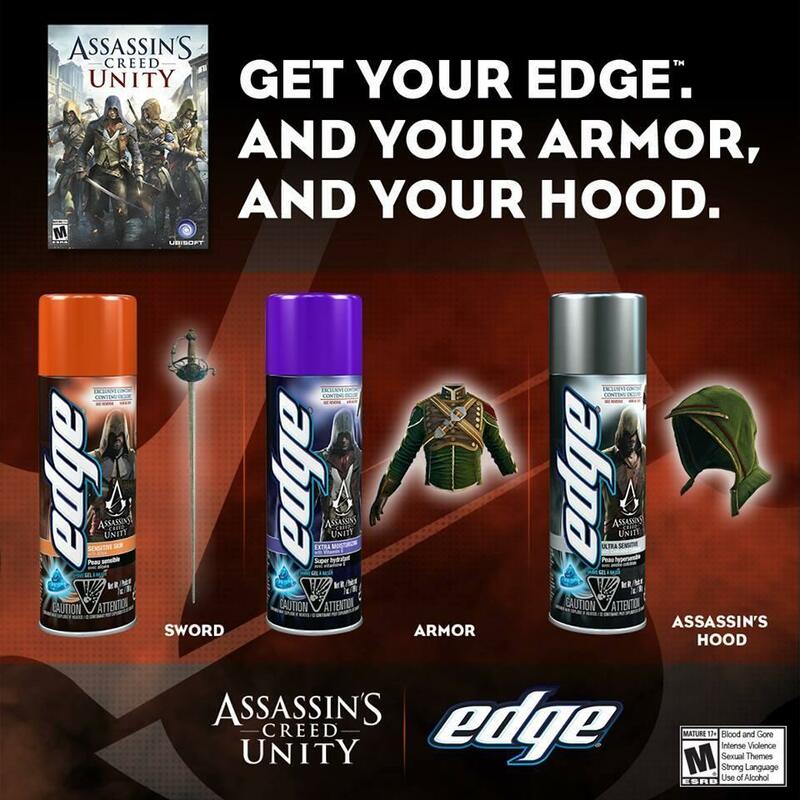 Edge Ultra Sensitive Shave Gel gives access to an exclusive downloadable Assassin’s Hood, contains colloidal oatmeal, and helps provide protection against razor burn. To further help celebrate the Assassin’s Creed Unity launch on November 11, Target stores will offer a complimentary $10 gift card to any customer purchasing both the Assassin’s Creed Unity game and any Assassin’s Creed Unity Limited Edition Edge Shave Gel can (excluding 2.75 oz). The promotion will last November 16–26. Print article This entry was posted by Art Eddy III on November 19, 2014 at 4:58 pm, and is filed under Entertainment. Follow any responses to this post through RSS 2.0. Both comments and pings are currently closed.